Hanukkah, the Festival of Lights, is one of my favorite holidays. until more oil could be produced. With my niece Dana, we are joining Trixi's Sew a Softie. as they try to save Hanukkah by bringing a box of matches to the Temple. they will still do their best. for the oil to light. he's been cheerful since cradle. in the lighting of light. he will lend a hand. must all win the day. Your little softies are so cute and the board game looks like fun. Really adorable how you make the softies to match the drawings. Fun to use with the handmade game, too. Well, this is an excellent idea! I can imagine all the fun going on at that table! Lovely post, Amalia. 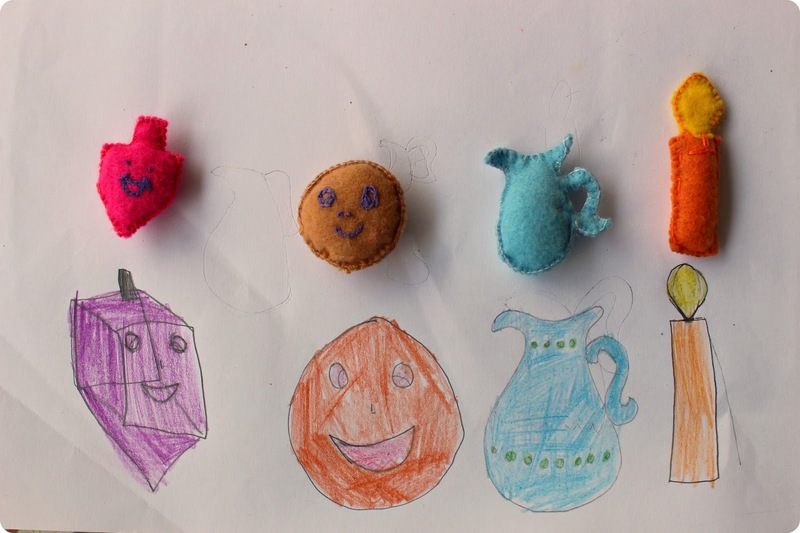 The softies are perfect, and what a fun way to teach the children. Thank you for sharing! The board game looks lovely! Amalia, you are so creative! I am quite convinced that this game is a great blessing and teaches so much. The game pieces/softies are darling! (I see that Hannukah and Christmas are very close this year. I like that we will all be celebrating!) And, btw, I want to play! A refreshing post..how sweet everything Amalia..:) I have made little felt things..aboyt 35 years ago,that velcroed onto a felt tree as an advent calendar..patience and love. You're so gifted Amelia. I love that poem! You are so creative, Amalia, and your nieces and nephews must love going to Auntie's house to play! The homemade game is so charming as are the softies you made to go along with it. And of course, no post is complete without your clever poetry! How fun ! You are such a talented lady Amelia, I'd love to have done this when my daughters were small, but I just sewed dresses for them and baked, that was the best part. I still do for C'mas with my grandgirls now. I love how you've taken these simple drawings and turned them into softies for this special occasion. I want to play the game with you. Wishing you a special Hannukah. The softies are adorable and I loved reading the story behind Hanukkah that I had forgotten about. Such a wonderful way to celebrate Hannukah! So creative to sew these cute selfies, the fellowship around the game looks lovely and so cozy! I love the board game - so sweet, and a lovely way to spend time together! You are such a smart girl! I love your idea of Hanukah softies and a game to go with them. What fa fun way to celebrate. Wishing you Happy Hanukah, Amelia. You made those? Nicely done and so perfect for Hanukkah. What a fun and creative idea. You make things so special...that is making special memories with your family. This is delightful, Amalia. What fun you must have had creating your game. Happy Hanukkah to you! I love the story of the Festival of Lights and the oil sufficient to burn for so long in the Temple. Cute softies and a great idea to use as part of a game! love the little softies made for this sweet game, how neat to bring the story to a game like this! So very creative as is your story that went along with it! You made your own game? 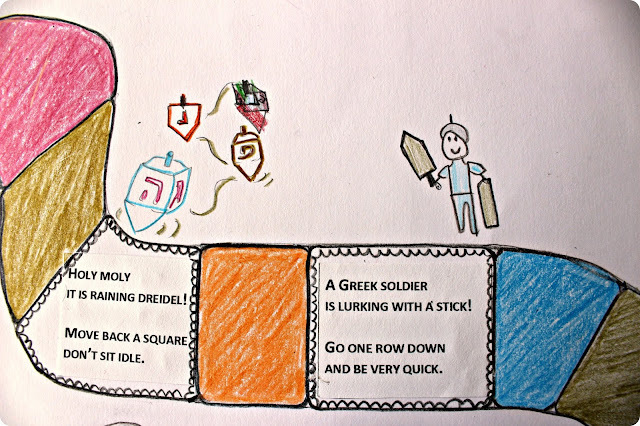 Because that would be something you would do:):) What is dreidel? This looks like fun! Have a happy Hanukkah:):) By the way do you know Lisa Isaacs (her blog is called "Handmade in Israel," and usually shows a card she makes - this week she is on the first row for ALL SEASONS) - Thank you so much for sharing the fun with all of us! I do know Lisa. She is a true artist and her cards are so unique. Oh what a joy, an absolute joy. I so enjoyed this post both your photo's and words. What a great idea - I love the little charcaters! Hope you're enjoying your holidays. Thank you for sharing the wonderful game, and the softies you made, with us! You are so clever ... such a thought provoking post. I love seeing your photos and reading your poems! Lovely post, Amalia. I love the board game idea! You and Dana are amazing!!! I love your softies and I love how you made the four softie friends part of a board game You're n awesome team and so thrilled to have you both join in the Sew a Softie crew!! Thanks for inviting us to take part, Trixi! We had a lot of fun with it. What fun and great way to learn a bit of history! Thanks for the information. These cuties make me smile. It was good the learn the history and I loved the poem you wrote to introduce the characters. Wow! This is such a fun away to learn history! I wish I would have known this in my childhood. Thanks for this lovely share. Too cute! Happy Hannukkah, Amalia! Amalia, this looks like a lot of fun! How creative! Happy Hanukkah to you!! The miracle of Hanukkah is such a great celebration to share with family. We ended up making two boards, one in English and one in Hebrew. You are welcome to both, Lisa! How sweet - thank you for the thought! Very sweet - what a wonderful, beautiful game. Happy Hanukkah to you and your family. So sweet! I love the board game and all the characters are adorable. 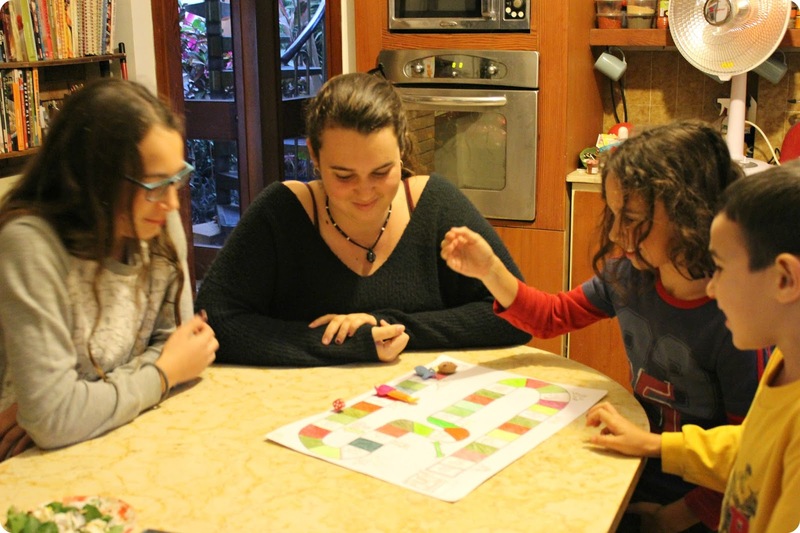 What a darling homemade game board, Amalia! Happy Hanukkah to you and your family! What a great way to celebrate the holiday! I love that little game! Love and hugs! you amaze me with your talent always dear ! this is AMAZING.so interesting . you all look fabulous . What a cute board game and sweet poem! Hello, Amalia! Happy Hanukkah to you and your family! The game, dreidel and the pretty lights are a fun time for the family. You are talented. Happy Thursday, enjoy your day and weekend ahead! What a beautiful board game and a lovely poem! Happy Hanukkah to you and your family! The memories you are creating will be treasured!! How lovely, Deb. We celebrate a Holiday of Holidays here in city every December, a coming together of all religions and a very good party. I love this, Amalia...you are so creative and so wonderful about sharing your creativity with the children. I'll bet they love crafting with you! Hi Amalia, This is beautiful and so creative. Looks like so much fun for the kids to craft and enjoy. You are making special memories. Thank you for sharing. Sending hugs your way! What a great craft for the kids to do!! Thanks so much for visiting!! You are always with great ideas and your handcrafts are so pretty! Having fun playing board games and using your softie is really fun! What a creative idea Amalia, wishing you the best of the year and happy Hanukkah. 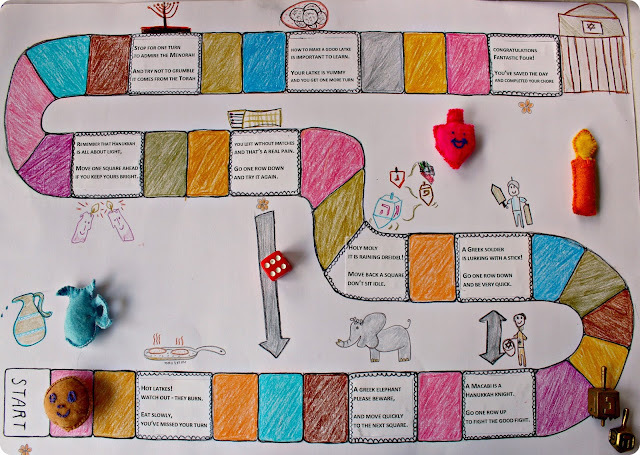 Hi Amalia, oh this post is so special, love that you made your own board game with a beautiful poem and softies to go with it. You really are talented. Such a lovely board game and from the heart. Loving your creations and of course your poems. Happy holidays to you. 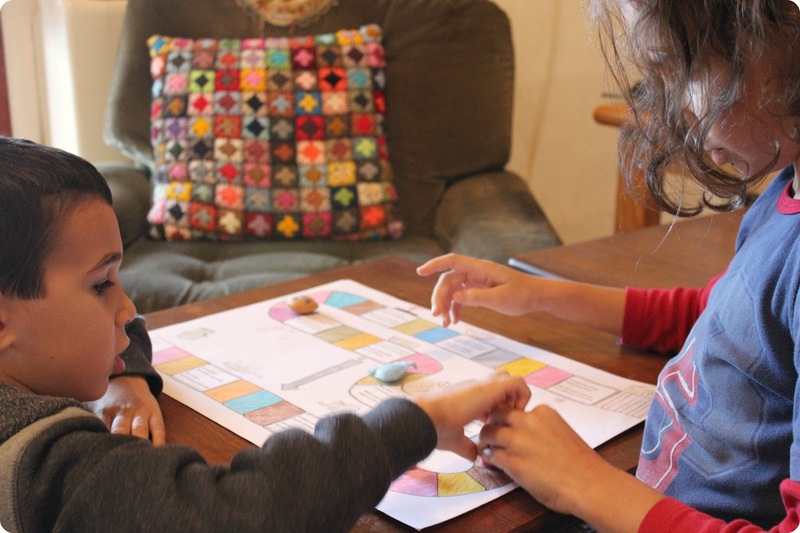 So much fun to have a homemade board game and the wonderful softies! I'm sure this will become a Hanukkah tradition! So wonderful and poetic! I admire your creativity and the cheerful atmosphere you spread around you. HOW VERY CREATIVE!!! I LOOOOOVE THIS! I also LOVE the background of your game! God is SO GOOD to his people! He is EVER FAITHFUL!!! ;) I'm SURE EVERYONE ENJOYED this game too! ;)THANK YOU for coming over to visit! You're TOO SWEET! ;)MANY BLESSINGS TO YOU & YOURS AMALIA, this Hanukkah!! Your little softies are adorable! Looks like everyone is enjoying the game! Wishing you and your family a very Happy Hanukkah, Amalia! You my dear have a very best Hanukkah, as for your soft little treasures you always come up with the coolest things to charm anyone with. Your poem and board game is the best. I love when others inspire being creative with their family. How utterly adorable, I love the way you are able to make everything come to life - what fun! The felt items look really lovely, and thank you for the poem! The softies are funny, the play is greatful. Wish you from the heart a wonderful time. Oh how I love this post, Amalia. Your little felt softies from the drawings, as ever, are amazing and your poem....just magic! A happy memory in childhood is able to conquer everything even after they have grown up. What a charming, uplifting way to start my morning this iron-cold day!! And what a loving scene that is, with the children gathered to play the timeless game with the small works of your own hands. Those charming, timeless little game-pieces represent such history and such a rich, long story, and what a sweet way to remember and pass the tradition. Such memories you're making, for them and for the generations to come. Thank you for visiting LAWN TEA all this year---just seeing your name pop up makes me smile, and I'm so glad we met. Sometimes, when I've read your post, I go to my cabinet and inhale the scent of the hyssop and the sumak sent to me several years ago by a dear online friend in Ashkelon. She is a Master Chocolatier, and does the most exquisite confections. Many many good wishes to you and all yours in this most wonderful season for both our families. 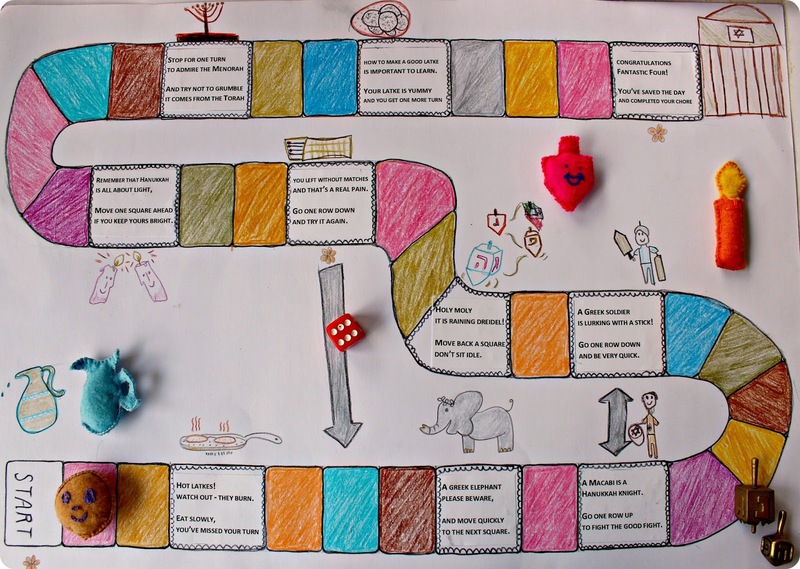 Such a nice idea to make a boardgame! This idea could be made in numerous varieties! You could custom it to your own family (if you have a younger brother move up to the next row). Although my ability to rhyme is limited, but I am sure you could find a suitable rhyme in no time! This is a wonderful idea! I have to try it. Your creativity never ceases to amaze me! Love it. I love those little felt place markers. Creating your own game is so fun Happy Hanukkah to you, Amalia. Love the story of the Festival of Lights.